People born under the Gemini sun are curious, energetic, and social. This air sign is expressive, witty, and capable of multi-tasking. Most Gemini people are intellectually inclined and love to share the information they have gathered. This zodiac sign enjoys a good conversation and often expresses themselves in a charming, intuitive, and logical way. Gemini’s are versatile and easily blend into many different groups and structures. Gemstones for Gemini include: Agate, Moonstone, Onyx, Amber, Chrysoprase, Turquoise, Tiger Eye, Amethyst, and Obsidian. Gemini, the sign of the twins, symbolizes an equal flow of yin-yang energy along with active mental pursuits. Agate gemstones bring stability, balance, and harmony to this zodiac sign, it promotes unity through a calm and steady strength of character. These nourishing gemstones encourage concentration, build inner-strength, and improve focus. This natural Agate necklace, Agate pocket stones, and Peridot lanyard charm will have you feeling confident and motivated. This gemstone zodiac set includes: Natural Agate pendant with 18” black leather necklace, (2) Agate pocket stones, and (1) Peridot OM lanyard charm (perfect for keychain or cell phone case). Gemini is the most versatile zodiac sign of all. This sign symbolizes an equal flow of yin-yang energy along with active mental pursuits. Those born under the Gemini sun are resourceful, charming, wise, and adventurous. White Agate gemstones bring stability, emotional harmony, and increased intellectual pursuits. These natural white gemstones purify energy and encourage peace, confidence, strength, and renewal. White Agate is a “Stone of New Life,” it alleviate stress from over-stimulation and improves intelligence, focus, memory, and communication skills. This gemstone zodiac set includes: White Agate pendant with 18” black leather necklace, (2) White Agate Pocket Stones, and (1) Hematite (Protected) Lanyard Charm (perfect for keychain or cell phone case). Gemini’s are expressive, affectionate, and curious. This zodiac sign is sociable and loves to have fun. Experiencing the world around them could easily become top priority, they desire social stimulation and verbal communication. Ruby Zoisite is a “Stone of Happiness,” these gemstones bring magnificent benefits to people born under the Gemini Sun. It ignites positive feelings and encourages spontaneity and adventure. This gemstone boosts passion, intellectual abilities, and enthusiasm. Gemini people benefit with this gemstone by embracing individuality, originality, love, and appreciation. 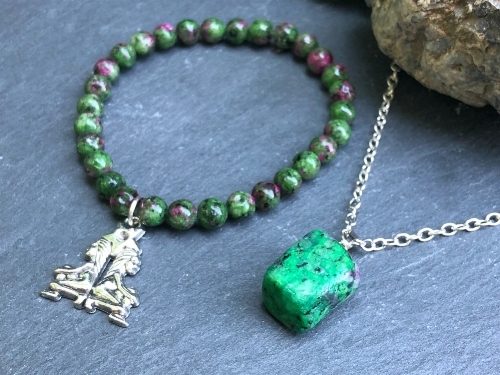 This gemstone zodiac set includes: Natural Ruby Zoisite pendant with 18” silver link chain, and stretch bead bracelet with silver zodiac charm. Gemini leather tie bracelet with Unakite Jasper gemstone. Unakte Jasper is a “Stone of Unity, Patience, Focus, Balance, and Persistence.” This gemstone lifts the mood and promotes acceptance of belonging, it helps eliminate bad habits and negative thought patterns. For Gemini, Unakite Jasper renews strength and encourages focus and persistence. Stay on track with this zodiac gemstone bracelet! Proudly speak your truth with this Blue Howlite necklace! This blue gemstone lifts the mood as it activates your Throat Chakra, it encourages communication and empowers you to stand up for what you believe in. Blue Howlite promotes self-awareness, enlightenment, clear communication, and personal insight. Become enlightened with this natural healing gem. Feel calm, centered, and confident with this natural Jade necklace. Jade soothes the mind and helps release negative thoughts, it brings a stabilizing effect to ones personality. This green gemstone brings balance and understanding. When you wear Jade jewelry, dignity is restored as your Heart Chakra is replenished. Malay Jade hugs your heart with positive energy! This green crystal heart radiates from within, turning you into a magnet for prosperity. It’s energetic glow creates an attraction, especially when it comes to matters of the heart. Lucky situations and prosperous opportunities are just around the corner with this green gemstone necklace. Fill your heart with happiness and prepare to receive love, luck, and abundance with Malay Jade jewelry! Lift your mood and release tension with this Blue-Green Howlite ring. This gemstone aleviates negativity and encourages excellent communication. Howlite jewelry helps to develop patience, it attracts peace and promotes a calm atmosphere. Be enlightened and get lifted with this natural gemstone ring. Gain awareness and composure like the King Cobra with this natural gemstone ring. White Howlite jewelry helps calms an overactive mind, it strengthens inner-power, patience, and overall persistence. This white gemstone encourages emotional balance and enhances communication. Wear this White Howlite ring to align and connect with pure infinite energy. Fill your soul with peace and contentment! This brilliant blue gemstone ring lifts tension and strengthens self-assurance. Turquoise Howlite promotes harmony, integrity, and emotional balance. Wear this natural gemstone ring to activate dignity, inner-strength, and for enlightened communication. Graduate to alumni status with this Blue Jade ring! This natural blue gemstone boosts self-confidence and encourages reflection. Wear Blue Jade to feel calm, centered, and at peace. This natural gemstone ring encourages clear communication and stimulates visions for a bright new future. Pave the path to success with this Blue Jade gemstone ring. A true goddess exemplifies love, beauty, and unity. Claim “Goddess” status with this White Howlite gemstone ring! White Howlite guides and aligns you with your higher-self. This natural gemstone ring promotes patience, peace, and tolerance. It activates wisdom and enlightenment. Fall in love with this enlightening gemstone! Princess Kore is the goddess of spring, she is kind, understanding, and represents new growth. Tiger Eye jewelry is divine, it grounds, stabilizes, harmonizes, and protects. This gemstone builds inner-strength and encourages leadership, courage, and integrity. Wear this natural gemstone ring to attract good vibes, recognize opportunities, and accept good fortune. Nourish and empower your soul with tiger eye! Increase self-awareness and become enlightened with Blue Howlite! Wear this blue gemstone bracelet to feel peace, tranquility, patience, and understanding. Blue Howlite helps calm emotions by discouraging negative thoughts and impulses. This Stone of Self-Improvement stimulates insight and self-control. Stay calm and content with Blue Howlite jewelry! “Negative energy is a powerful sin, everything seems foggy and confusion sets in. When it’s hard to detect which outcome will win… the light within begins to dim. Crystal Clear Quartz brings positive energy, clarity, and heightened awareness. These clear gemstones guide us through darkness and reactivate unity. Quartz amplifies light, attracts opportunities, and stimulates purpose. Place Clear Quartz Wishing Stones in the palm of your hands to manifest mental clarity, focus, and positive intentions. Snow Quartz brings light to situations, these gentle white gemstones create balance, mental clarity, and understanding. These crystals bring patience, they encourage love and help overcome the “victim mentality.” Place Snow Quartz Wishing Stones in the palm of your hands while meditating, or simply put them in a visible location. Epidote overcomes negativity, it brings hope, inspiration, and energetic density. This gemstone attracts what’s best for me, it provides optimism, abundance, and prosperity.